Little detail is known about the Kothringi. They generally preferred to go naked, although a few wore clothes when outside their native land. They appear to have worshipped a god named Z'en—a God of Toil— as well as Dibella, Mara, and Kynareth. 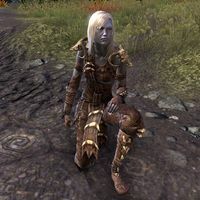 [UOL 1] Kothringi knights made up a large part of the imperial garrison of Gideon, and Empress Tavia, wife of Reman III, the last ruler of the Reman Dynasty, had a Kothringi knight named Zuuk with whom she conspired to assassinate her husband. After Reman III was assassinated, "Lord" Zuuk returned to Shadowfen and founded a town which was eventually named after him.